"The coolest Chinese teacher out there. Totally rad!!" "The curriculum has logical links that shield beginners from the unnecessary complexities of Chinese grammar while providing a solid understanding of how the language is constructed. It is definitely new, and it definitely works." "Like a rockstar teacher. Excellent for beginners. Entertaining too!" "As an instructor, I have found Professor Hainzinger's teaching material was very practical; it was very easy to be inserted into our classroom activities; because of its structural style and its accompanying video." Chinese with Mike is like nothing you have ever experienced when it comes to learning Chinese. Teacher Mike's method is entertaining and effective--the kind of addictive learning you'll want to come back to time and again. With Teacher Mike's 60 short, video lessons, a companion coursebook, and audio, you will learn essential Chinese in no time. This program is suitable for self-study or as a supplement to classroom study or home schooling. 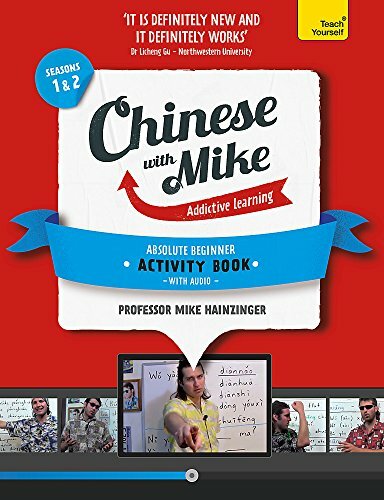 For use with Chinese with Mike: A Coursebook for Absolute Beginners with Audio CD. Season 1: Pinyin, the four tones and writing system, common words, phrases, and typical conversations. In no time you'll be able to talk about yourself, your family, your friends, your job, your home, your dogs and cats. Season 2: More conversation topics so you can tell people you can speak Chinese, you like to play basketball, you want to eat beef fried rice, and more.